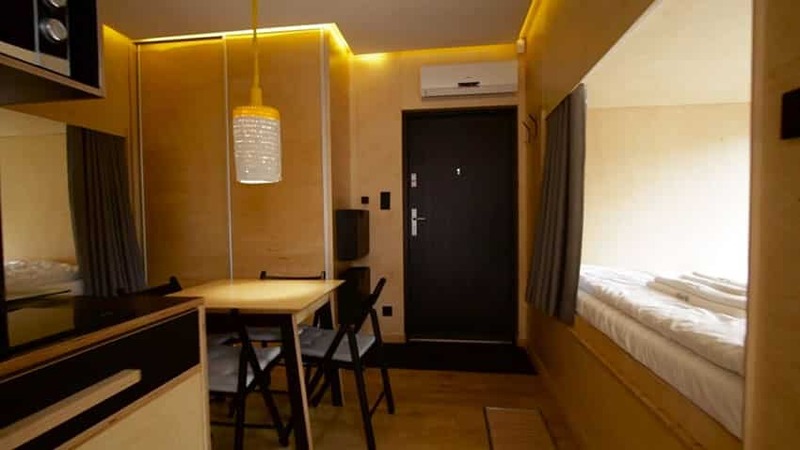 The modern micro apartment design shown below is a one room studio micro flat that combines a living space, kitchenette and bedroom in to one small space. 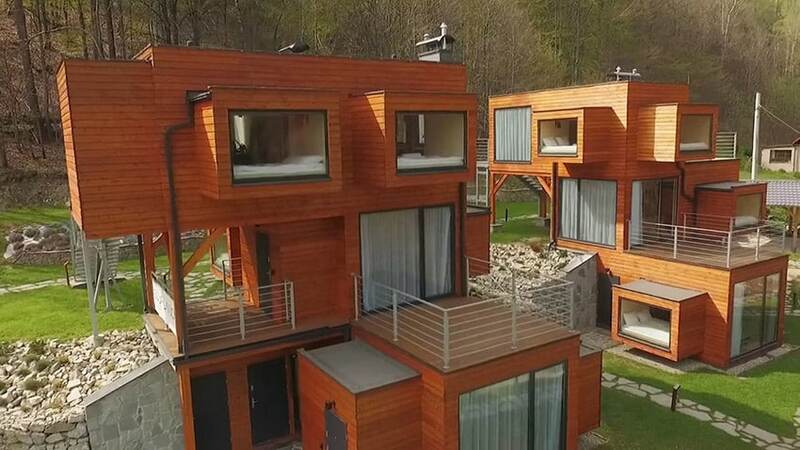 The Szuflandii Apartments are located in Wisła, Poland. Popular for its skiing and beautiful scenery this Central European location is a popular year-round tourist destination. 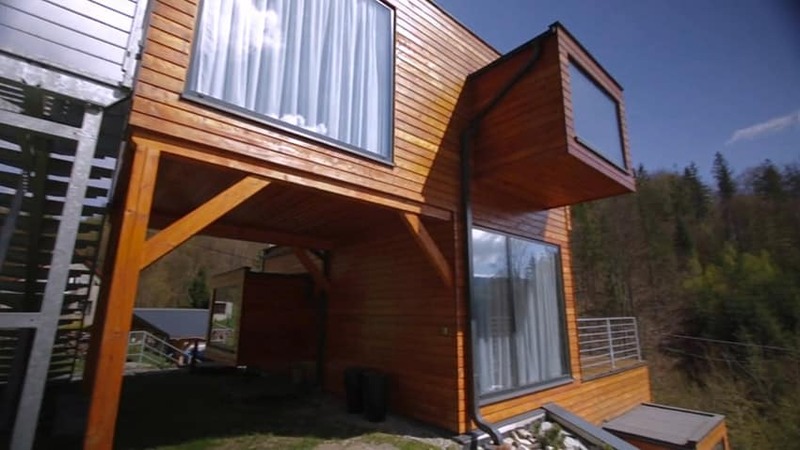 The apartments offer eight units with forest views and are situated only 5 miles from the Cienkow Ski Lift. In the picture above you can see the modern architecture of the micro apartments and the gorgeous stonework and landscaping of the grounds. 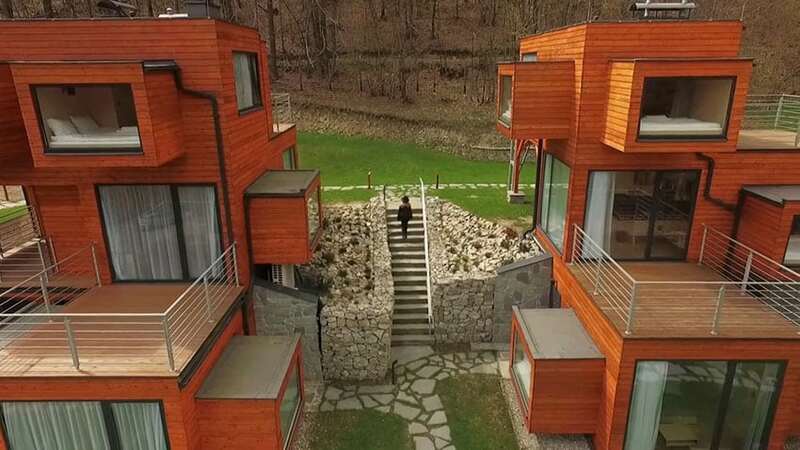 The apartments are located on the Kiczera mountain area and surrounded by mountain streams and forest. Some rooms offer accommodations for up to four people with two sleeping areas from one apartment unit. From this aerial view of the apartments one can see the apartments balconies with plenty of opportunities to enjoy the impressive views. Intricate stone pathways meander around the grounds allowing one to take in the sights from all angles. The modern design of the apartment is visually appealing and constructed of natural wood materials to carefully blend with the environment. 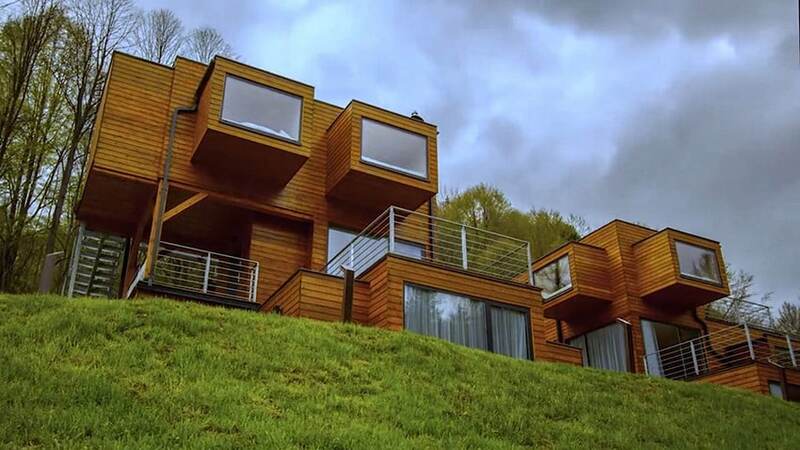 The small sleeping lofts offer impressive views and a one of a kind sleeping room. Visitors can take in the sights day or night and fully appreciate the stunning outdoor landscapes. From this angle you can see in to the micro apartments with their large picture windows and rooms suspended from the main structure of the building. 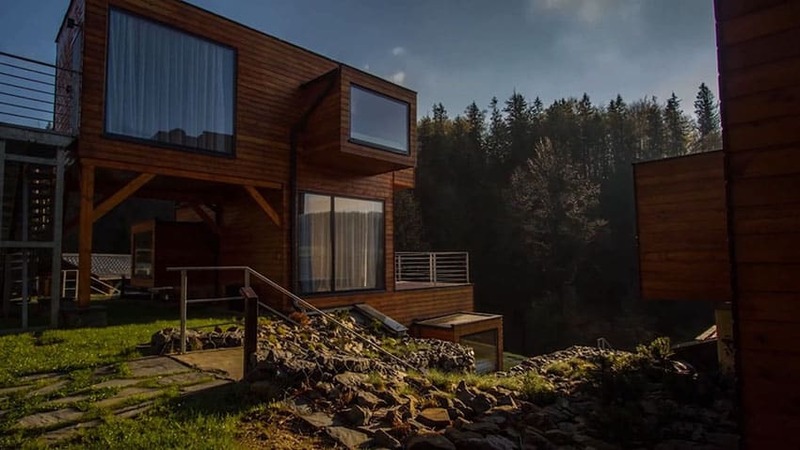 A visitor enjoys a cup of coffee while taking in the sights of the forests of Beskid. Comfortable linens are provided so one can feel right at home. The small kitchenette in each micro apartment is equipped with all of the necessities. Kitchens have a refrigerator, electric cooker, kettle, utensils and a microwave. The kitchen cabinet and table is constructed from natural birch wood material which is stylish and fits the design aesthetic. 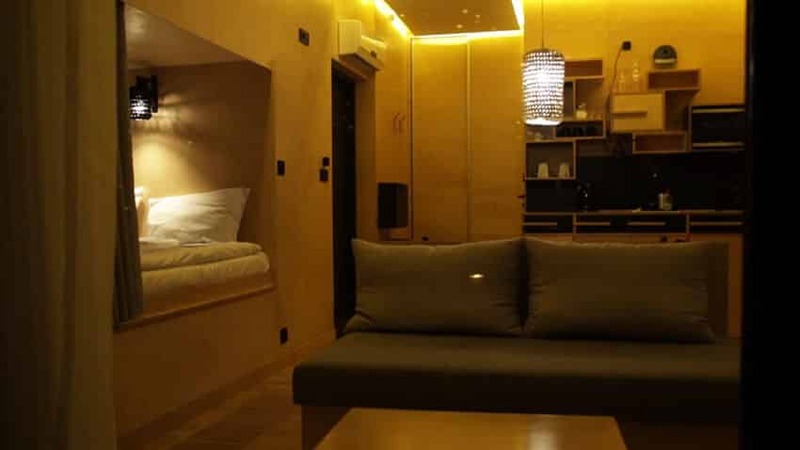 The living room of the micro apartment contains a small loveseat and table. From the main room the sleeping quarters and kitchen are quite accessible within a few paces. This micro apartment was designed for a family of four with two sleeping rooms and a central dining table. Modern lighting fixtures and recessed lighting offer a relaxing glow and attractive night time ambiance. 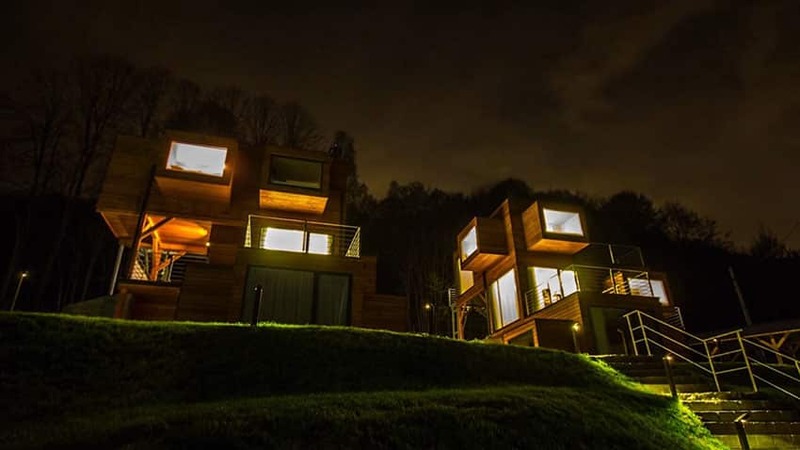 The micro apartment with dual beds glows at night and provides the opportunity to take in the views from two directions. The apartments have a staggered terraces design with give it an architectural appeal. Natural rock landscaping and pathways create a harmonious feel and offer a sense of calm to guests. 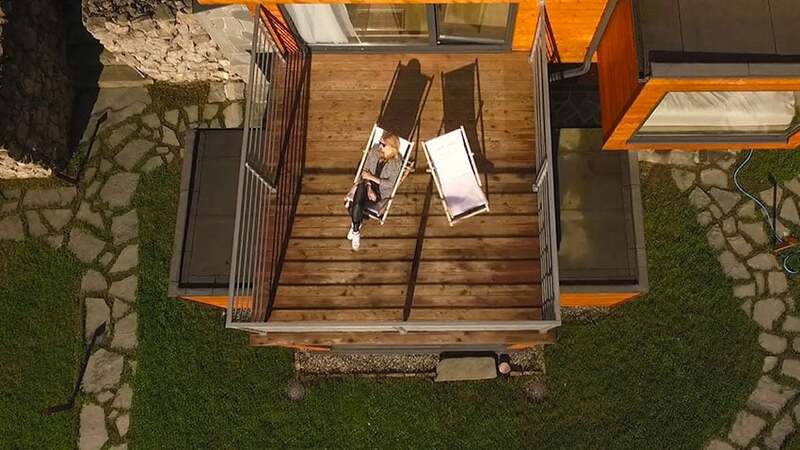 A young woman enjoys the balcony of her micro apartment with lounge chairs to take in the suns rays and enjoy the outdoors. 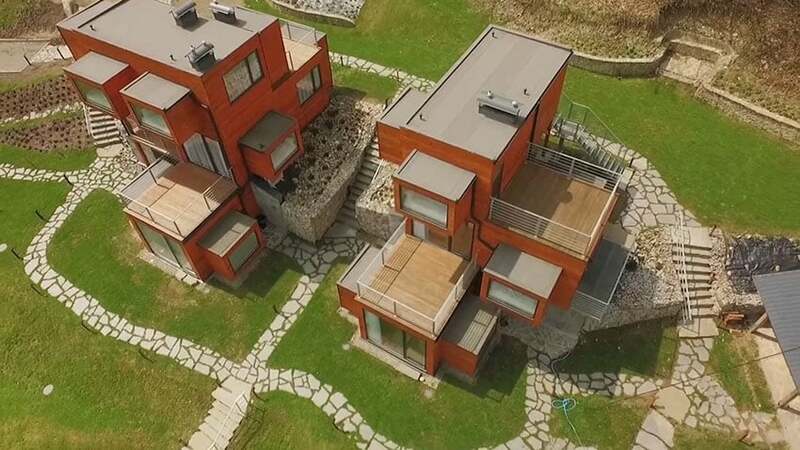 The apartments are situated on the slope of Kiczera which offers summertime bike riding, hiking, and winter skiing opportunities. The Vistula River is a short 4 km from the residence. 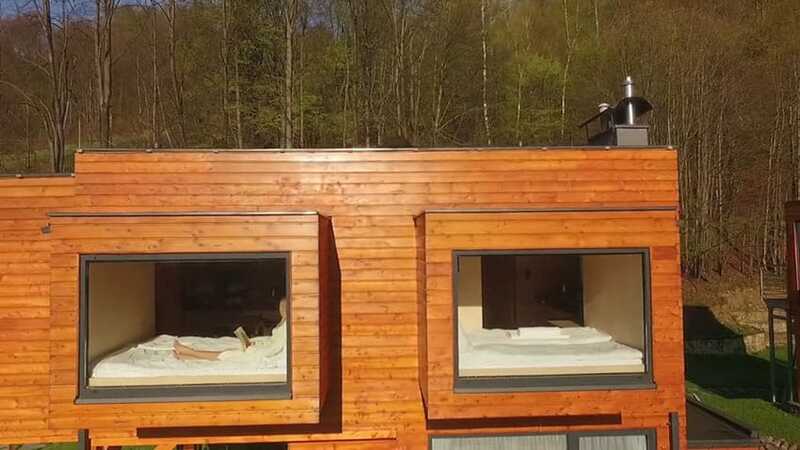 A close-up view of the outdoor structure of the apartments including the modern design of the suspended bedroom. 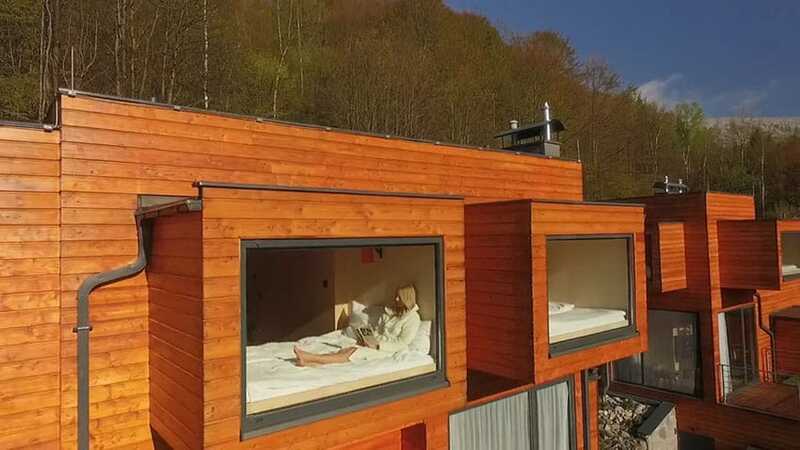 Light illuminating from the large windows of the Szuflandii modern micro apartment design. 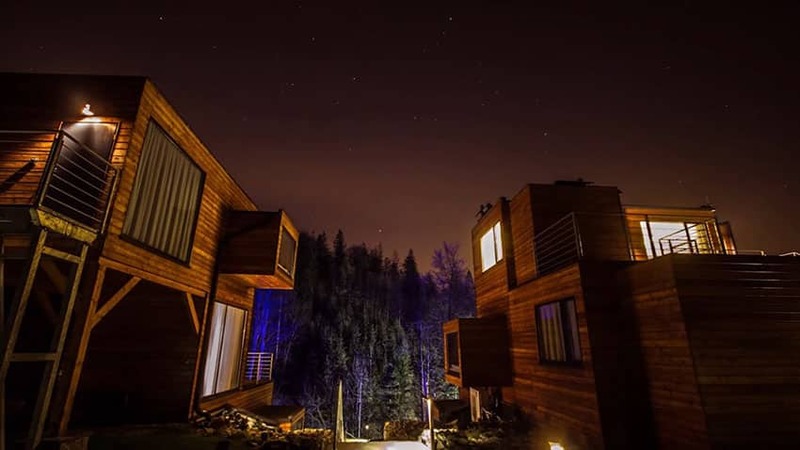 A beautiful setting to take in the natural landscape and night time sky. 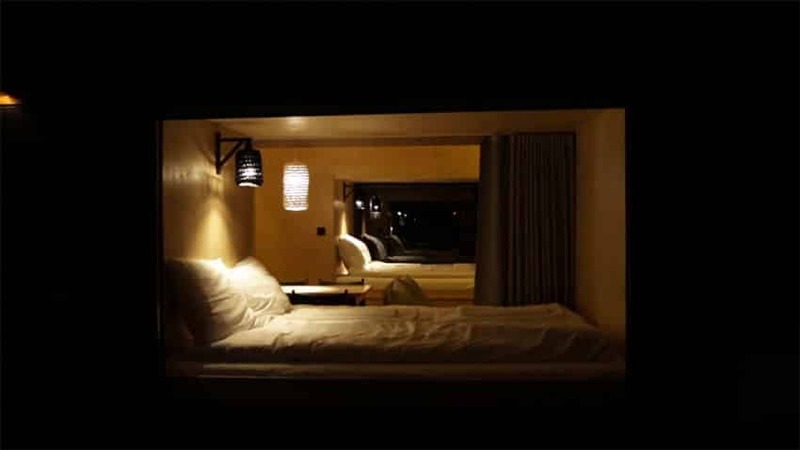 Bedrooms were designed specifically to maximize views and are perfect for quiet contemplation and relaxation. You can visit this page to learn more about Szuflandii Apartments located in Wisła, Poland.